Beavercreek senior co-captain Ryan Bernt (4) gathers control of the ball, as Fairborn sophomore midfielder Keegan Dierker defends, during Tuesday night’s Oct. 3 high school boys soccer match at Fairborn High School. 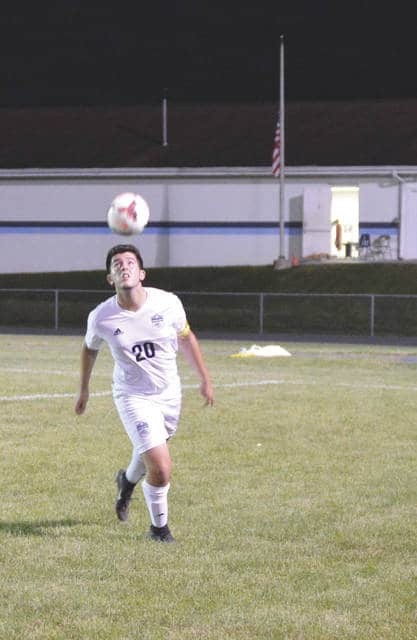 Skyhawks senior defender Diego Munoz heads the ball during first-half play Tuesday Oct. 3 against state-ranked Beavercreek, in Fairborn. Fairborn junior midfielder Chris Lawrence-White (right) turns the ball toward the Beavercreek goal as Beavercreek’s junior defender Mark Rzecznik guards him closely, Oct. 3 in a boys high school soccer match at Fairborn High. 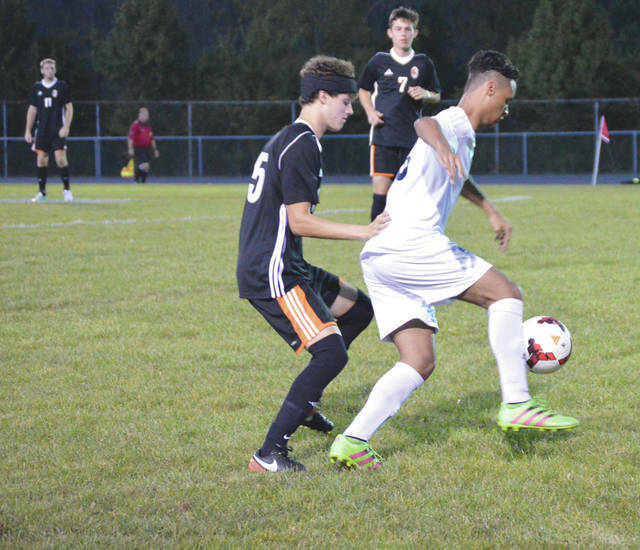 FAIRBORN — Pretty much everybody at the Fairborn soccer stadium knew that state-ranked Beavercreek had a pretty good team. The visiting Battling Beavers didn’t prove anyone wrong. 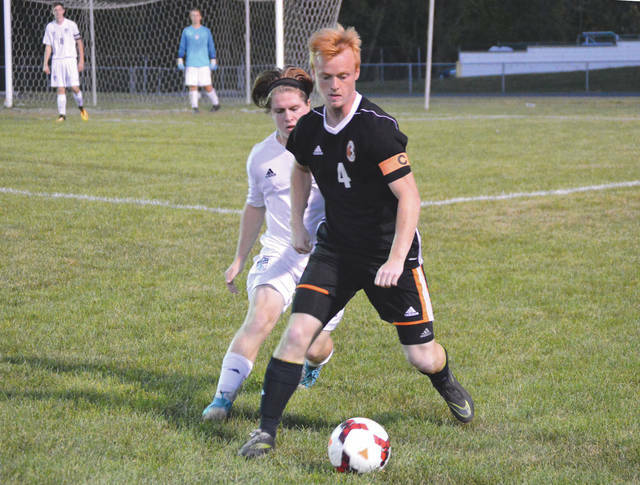 Beavercreek played most of the match against Fairborn on the Skyhawks’ side of the field, and rolled to a 6-0 win, Oct. 3 in a Greater Western Ohio Conference crossover match-up between two Greene County neighbors. Dominic Calabrese, a senior forward and co-captain, scored the first two goals, then fellow senior co-captain Daniel Donohue added the third goal of the night. Junior midfielder Ryan Wightman had the first goal of the second half, then junior midfielders Caleb Russell and Joseph Butman knocked in the final two goals for the Beavers, now 10-0-2 overall and ranked No. 3 in the latest Ohio Scholastic Soccer Coaches Association poll. Jacob Westerkamp, Vincent Peden, Russell and Butman were each credited with assists as well. Beavers coach John Guiliano liked what he saw from his veteran team Tuesday night. Fairborn’s Greg Dierker said the difference is Beavercreek’s youth feeder program, which gives their area players experience from roughly 5 years of age up through high school. Fairborn’s youth program isn’t as developed yet. “I was satisfied with they way we played,” Dierker said. “The boys played hard. … For the most part, the team wanted to play hard, and they did play hard. Beavercreek is back in action on Thursday, Oct. 5 when they play at Cincinnati Elder for a 7 p.m. non-league match. Fairborn returns to the pitch Saturday, Oct. 7 in Yellow Springs. That non-league match between Greene County teams has a 2 p.m. start. But both coaches pointed toward their upcoming matches on Tuesday, Oct. 10 as keys to their seasons. On that day, Fairborn will battle at 7:15 p.m. against host Xenia for the GWOC American South divisional crown, and Beavercreek will be in Centerville battling the Elks at 7 p.m. for the GWOC National East title.